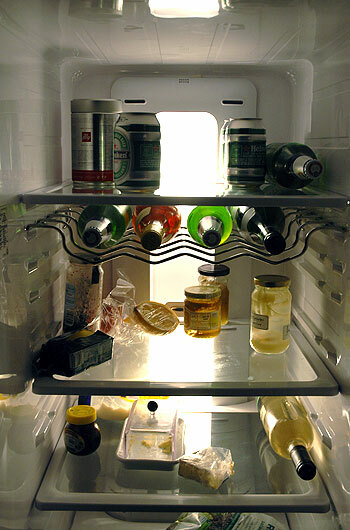 There's nothing to eat. There's nothing in the fridge. You can see for yourselves, take a good look, see if you can spot anything that you might fancy for dinner. Ok, I could get utterly pissed on all the booze, which might alleviate the situation for a while until I wander out into the night in search of a kebab and die of exposure on a park bench. That aside, the cupboards are bare and dinner seems to be a half empty tin of anchovies and some lemon curd. Oh yeah, smeared with butter and marmite. I'm all for catch what you can, rustling and general invention in the kitchen, but I have to say tonight I've reached the tipping point. The point at which it is no longer possible to make a meal with the food you have in the house. There must be name for this. Yes, now I come to think of it there probably is. Hunger. Oh well, Cheers! isn't that a wedge of cheese by the butter? at least you can see what you have in there! hey there...was browsing through blogs and landed here. Very nice! Wish I could cook like you! !